Properly outfitting a work bench to work with wire might include more tools than first comes to mind. Although it can be a fun challenge to work on a project MacGyver style, using the proper tools will always lead to better results. For this reason, it's important to understand the difference between wire strippers, cutters, pliers and crimpers. First off, let's get to know the standardized system for measuring diameters of single, solid round electrically conducting wire, the American Wire Gauge (AWG). You will see AWG referenced when determining the appropriate size of some wire tools. With AWG, an increased gauge number signifies a decreasing wire diameter. It is based upon a circular mil system; one mil is equal to 0.001 inch. 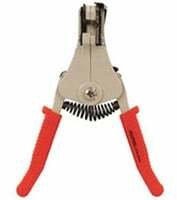 Wire strippers are used to remove the insulation from electric wires in order to make contact. There are two primary types: manual and automatic. Of course there is the time consuming scissor method as well as the destructive method of biting off the insulation that can result in pain and a hefty dental bill. We don't recommend either of the latter two methods. A manual wire stripper has opposing blades like a pair of scissors, but has a notch in the middle of the blades to place the wire. The stripper is then rotated around the wire so the outer insulation comes off while leaving the actual wire intact. Some wire strippers have varying notch sizes which allow you to strip wires at various AWGs without twisting. There are also automatic wire strippers. They have one side that grips the wire while the other side removes its insulation. Although an automatic stripper greatly reduces the effort required, it can also break thinner wires so they are not suited for all applications. When choosing a stripper, make sure that it has a comfortable grip, cleanly removes insulation from wires, and that it keeps the actual wire intact. You could use a knife to strip a wire. Place the knife on the wire and roll it until the insulation is loose enough to remove with your fingers. Scissors can also work if you don't have a knife at your disposal. Using a knife or scissors is a slow process, and the wires can be cut easily. Both of these methods get the job done, but using a simple wire stripper will save time and your wire. 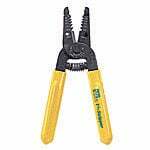 Wire cutters are commonly used to cut copper, brass, iron, aluminum, and steel wire. 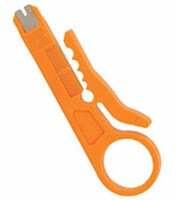 Some wire cutters have insulated handles which ensure that you will not get shocked from the wires you’re working with. Diagonal cutters have intersecting jaws that cut the wire at an angle, leaving a flat tip. Electricians commonly refer to these as flush cutters in order to differentiate them from symmetrical cutters, which leave a pointed tip. Unlike a symmetrical cutter, a flush cutter allows you to cut a wire very close to its base. Pliers are built similarly to scissors in that they have two levers jointed at a fulcrum. However, instead of having blades as levers, they have jaws that grip an object when the two handles are squeezed. 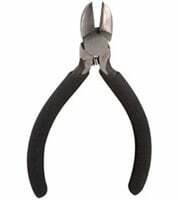 Although pliers serve the same general purpose, there is a wide variety of pliers that serve different specific purposes. 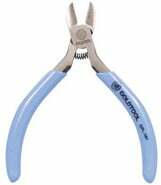 Long nose pliers are commonly used to squeeze in tight spaces and move/bend/loop wires. Long-nose pliers are also great for precision. 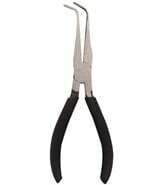 Cutting pliers have sharp edges that can shear through thick electrical wire and nails/screws. 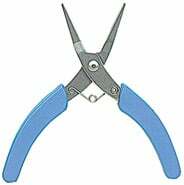 Electronics pliers or micro pliers have a small and narrow jaw to easily cut delicate electronic components on circuit boards or delicate jewelry wire. Bent nose pliers have jaws bent at an angle near the tip helping you reach tight spaces with ease. 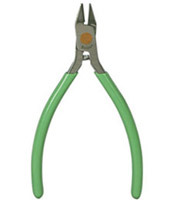 Flat-nose pliers have large, flat, and rectangular jaws that are used to hold and bend wires. The large surface area of the jaws makes it very simple to tightly grip objects. Crimping is often used to affix a connector to the end of a cable. Wire crimpers look like a pair of pliers, but join two pieces of metal or other ductile materials (such as wire to a metal plate) together. A crimper deforms one or both of the pieces, which holds them together. Some crimpers are ratcheted, meaning the pieces you are working with will not be released until a threshold pressure is delivered. Ratcheted crimpers sometimes come with interchangeable dies that allow you to crimp connectors of varying widths. When looking for a crimper, be sure to verify the types of wire or cable it is capable of crimping. There aren't many recommended alternatives to a wire crimper either. You could use a knife and a thin screwdriver, but it's not guaranteed to work and you may need a new cable if unsuccessful. The correct tool to use depends on the job at hand so avoid ruining a good project with a bad tool. Remember that wire strippers are best for removing the insulation from wire, while cutters are best for (you guessed it) cutting wire. 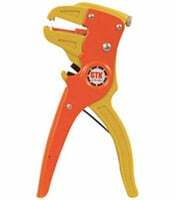 Pliers help you reach, bend, grab, cut, hold and loop wire, and crimpers are the best tool to join two pieces of ductile material together. Jason is a returning summer intern at Jameco and an upcoming freshman at the University of Washington. He is excited to learn about business and medicine while at Washington. His passions include watching sports, photography, and exploring new places.